Marbles Kids Museum is the ideal destination for your 3, 4 or 5 year-old group, with hands-on, minds-on exhibits and play experiences that are perfect for preschool learners. If your preschool classroom is under Title I, NC Pre K, Head start or serves low-income and at-risk communities, click here to find out if your class qualifies for our Full Circle Field Trip program. Students take on the role of good citizens as they become firemen, journalists, farmers, grocery store clerks, paramedics and teachers They collaborate, cooperate and problem solve to provide services and explore how people work and live together. Explore physical properties of water and solids in Splash as students test what sinks or floats at the water tables, conduct experiments on the USS Science Sub and set sail for adventure on the pirate ship. Investigate what makes a garden grow and help care for the vegetables and flowers in Sun Sprouts.Students work together to identify roots,stems,leaves, flowers and seeds that make up healthy food choices. Presented by Blue Cross and Blue Shield of North Carolina. Students play around with sound and whimsical vibrations to compose their own melodies on giant outdoor percussion instruments. Presented by The Jandy Ammons Foundation. Students explore how people earn and use money for goods and services in the pizzeria or pet shop. Money flows through the bank as they work to save and make deposits and withdrawals. In partnership with your North Carolina banks. Create, innovate, design and construct. Students solve problems, engineer solutions and experiment with how objects move as they build cars, use a variety of materials to design inventions and build super structures with giant legos. Students put their skeletal and muscular systems to the test as they shoot, skate, climb, dribble and balance.Cook up a balanced mealin Healthy Kitchen choosing foods from the My Plate table to fuel the fun. Presented by Carolina Hurricanes. Using cranks,levers and pulleys, students work together to keep the electricity flowing through the power grid. Students learn about where energy comes from and how we use and save it. Presented by ABB. Charge up hands-on play at challenge stations about science, technology, engineering and math! Students make and test fliers that soar up wind towers. They build and re-build circuits and engineer solutions to brain teasers. Presented by Duke Energy. Artists at work!Imagination and self-expression unfold as students use a variety of materialsto create artistic masterpieces. It's all about the process. 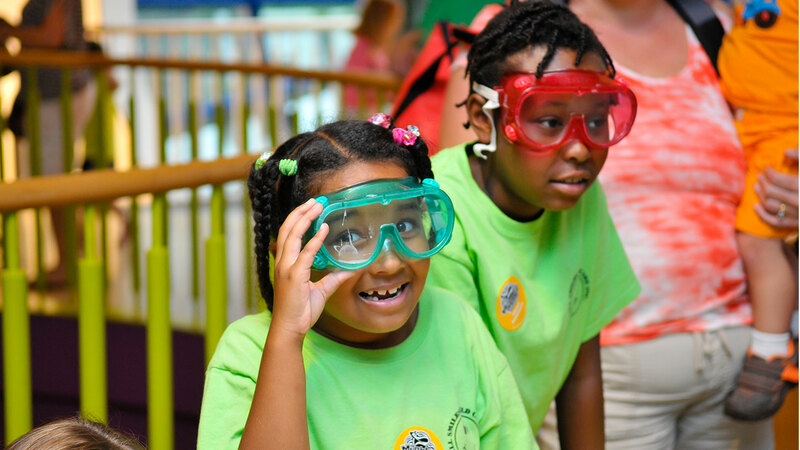 At Marbles Kids Museum, we believe in the power of imagination to inspire learning, and we believe strongly in our responsibility to make our unique museum experience available and accessible to all children. Through Marble’s Full Circle program, eligible preschools and community organizations can bring the children they serve to Marbles Kids Museum as a group free of charge up to three times per calendar year. At Marbles Kids Museum, children engage in creative and educational play in our hands-on, minds-on exhibits and programs. Play is essential for learning and human development. When children engage in play at Marbles Kids Museum, they learn to solve problems, make decisions, recognize boundaries, express themselves and communicate with others. It is well proven that children who play do better in school and become more successful adults. To apply for our Full Circle program, please complete the Full Circle form here. Once your application is received and reviewed, you will be notified of eligibility. Please allow 1-2 weeks for notification. Each Full Circle Field Trip is limited to 65 people total, including children and chaperones. A minimum chaperone-to-child ratio of 1:5 is required. Full Circle Field Trips visits must be scheduled in advance with our Groups Coordinator by calling 919.857.1049. We do not accommodate walk-in requests for free admission. If you have any questions about applying for or participating in the Full Circle program, please contact Janine Eash at 919.857.1021.